Radio Kansel 657 AM Listen Live . 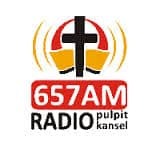 Radio Kansel is an Afrikaans South African Christian radio station with Christian values . Radio Kansel praise the Lord with current talk radio and provide a clear Christian message .